Blood type O conveys protection against malaria because RIFIN, a protein secreted by parasites, bonds weakly with type O blood cells while strongly linking to type A. Photo courtesy of Shutterstock. In a list of the world’s most deadly infectious diseases, malaria is ranked third, behind tuberculosis and HIV, when it comes to annual casualties around the world. 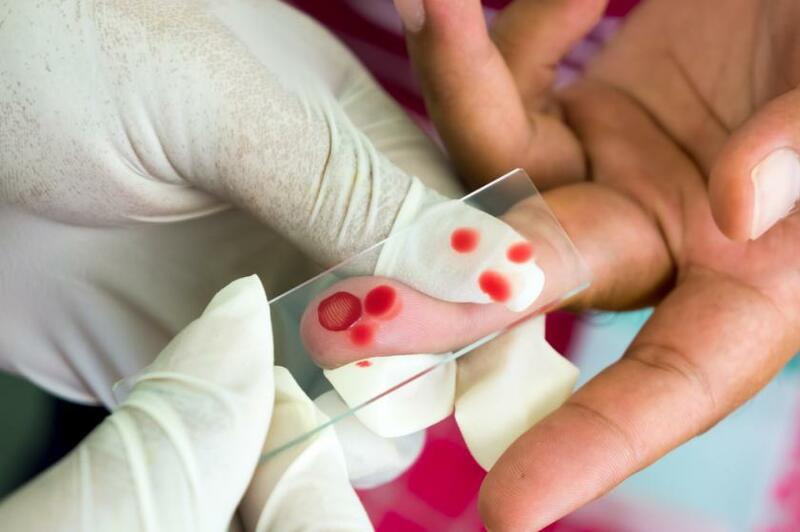 While scientists have known for some time that people with blood type O are protected from the most severe (and deadly) forms of malaria, they have never understood the reasons why. Now, Scandinavian researchers explain how a protein secreted by malarial parasites makes its way to the surface of blood cells, where it acts like glue, and blocks blood flow (and ultimately leads to death). However, this protein only weakly bonds with type O blood cells, the researchers say, while it strongly bonds to type A. "The new knowledge is important in order to develop new treatments for severe malaria," Dr. Mats Wahlgren, a professor in microbiology and cell biology at Sweden’s Karolinska Institutet, told Medical Daily in an email, clarifying that to treat or cure patients it is necessary "to understand the mechanisms that bring about severe disease." Importantly, having demonstrated the ways type O blood protects against severe malaria, this explains why the blood type is so common in areas where malaria is common. “In Nigeria, for instance, more than half of the population belongs to blood group O, which protects against malaria," Wahlgren stated in a press release. Ninety percent of all malaria deaths occur in Africa. Nearly 600,000 deaths occurred in 2013, according to the World Health Organization, the result of about 198 million cases of malaria. The disease is caused by different kinds of parasites, which are spread to people through infected mosquitoes, which bite between dusk and dawn. Pretty much all cases of severe, sometimes fatal, malaria result from the Plasmodium falciparum species of parasite. What happens in the worst cases of malaria is infected red blood cells stick to capillaries and other small vessels in an infected person’s circulatory system, blocking blood flow and causing oxygen deficiency and tissue damage. This leads to coma, brain damage, and in some cases death. So what’s going on there? The team of Karolinska Institutet scientists who have been studying the RIFIN protein say this parasitic secretion is key to why only some blood types are vulnerable to the most severe forms of malaria. Using data from various experiments on cell cultures and animals, they demonstrate how the Plasmodium falciparum parasite secretes RIFIN. This special protein makes its way to the surface of an infected person’s blood cells, where it becomes sticky and begins its damage. However, while RIFIN bonds strongly with type A blood cells, it only weakly links to type O. While simple, this explanation only became possible after the researchers had isolated the correct one of many existing variants of the protein. "The RIFINs have not be known to have a role in development of severe malaria previously," Wahlgren told Medical Daily. Now, though, he believes these proteins can be used as "targets when screening for new drugs." Generally, the news of malaria is all good, even if a new issue of mosquitoes becoming resistant to insecticide-treated nets has emerged. However, in Africa, the prevalence of this disease has been sloping downward since 2000. Though the population in high transmission areas has increased by 43 percent, WHO estimates infections fell from 173 million in 2000 to 128 million in 2013 — a reduction of 26 percent. "I started to work with malaria of the simple reason that is a disease of the poor and there was a lack of knowledge, there was a lot to be done," Wahlgren told Medical Daily. Apparently, the work of Wahlgren and other scientists in the field has been beneficial. Source: Goel S, Palmkvist M, Moll K, et al. RIFINs are Adhesins Implicated in Severe Plasmodium falciparum Malaria. Nature Medicine. 2015.